Rosedale’s first barrel of compost using the bokashi method was opened on Wednesday, May 10. 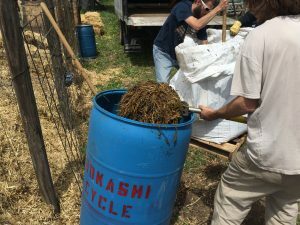 Bokashi is a composting method that uses organic microbes to breakdown plant material into usable compost. 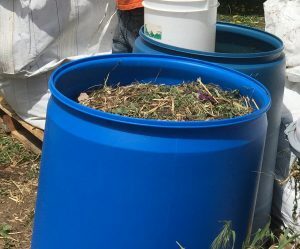 The method is much quicker than traditional composting–this barrel of garden plant material(including weeds) took just over a week to break down into a usable compost “mash” and compost “tea”. The goal is to be able to process all plant material from Rosedale Garden using this method. The result will be a very nutrient rich compost, and compost “tea”, for gardeners to use on their plots, ultimately eliminating the need to buy compost from any outside source. 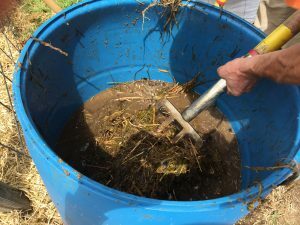 The tea is poured off to be used as a foliar feed and the mash can be added directly to your garden to serve as compost, creating a very rich topsoil. 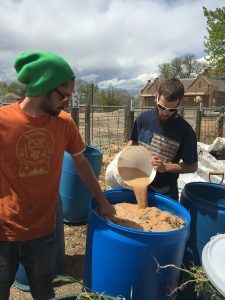 Once the mash is added to your garden, the breakdown process continues, and within just a few days will be completely incorporated into the soil. The compost team will keep the garden posted on how this new composting method is working and how gardeners will be able to use the compost that is created.